I measure my success as an outdoorsman in matches. If I can light and sustain a campfire with minimal matches – I declare success. 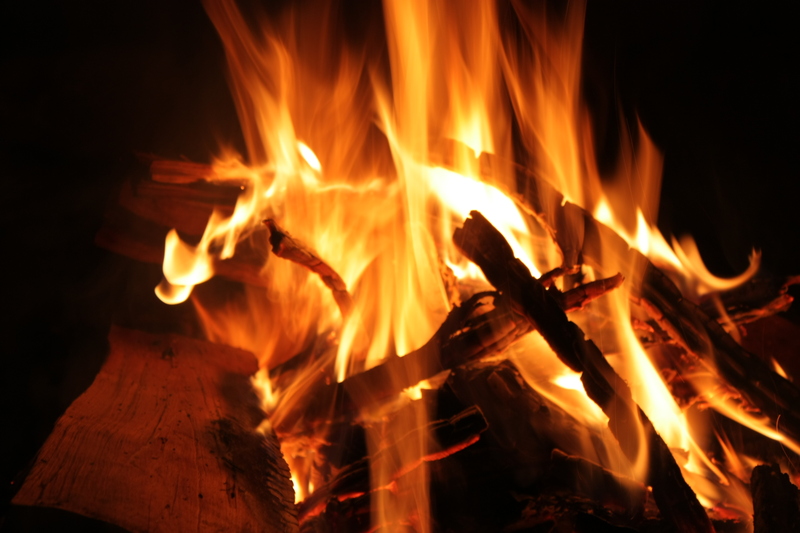 On Saturday night – it was a one match campfire. Success! But let me back up and share with you the start of a wonderful weekend in upstate New York. We left early Saturday morning and directed the GPS to take us to Malone, NY – home of the ‘2010 Redneck Games‘. We arrived early, as did the heat and the humidity, but all that meant was that we didn’t have to wait in line for the beer keg toss, the tire toss or the tup-r-ware coin toss. All good fun. Not only was there ‘Bessy Bingo’, there was a baseball game where the bases were made out of cow dung. We watched a game and saw an eager young man slide into home ! The Redneck Games were a fundraiser for the Make-a-Wish Foundation and apart from the games included the ‘Weird Al Yankovic’ of country music himself, Cletus T. Judd. His 45 minute show was succinct, satirical and funny. No doubt his early afternoon show was ‘G’rated with all the kids in the grandstands. This was the warm up for the main attraction – at least in the eyes of my son – Megasauras! 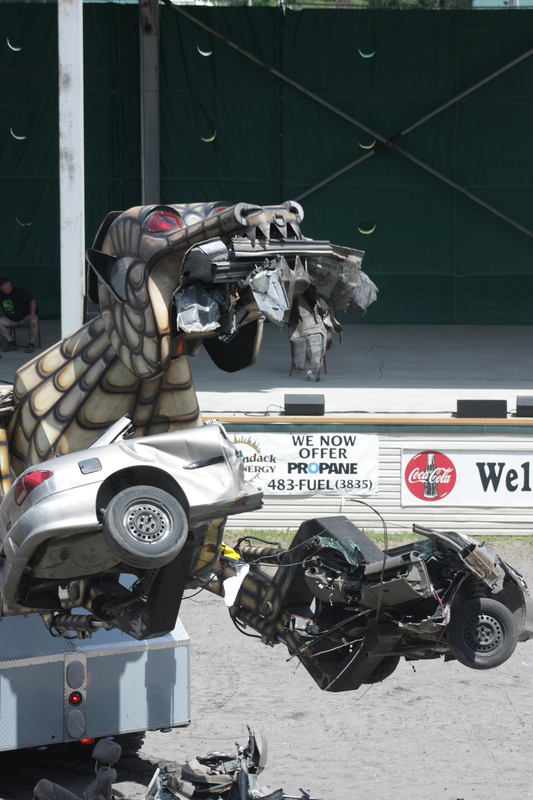 The 3 story, transforming beast breathed fire and ate a Chevrolet Cavalier for lunch! This wowed and amazed my son and all those in attendance. .
Not to be outdone by songs of parody and car eating monsters, we also enjoyed some fine displays of driving skills. 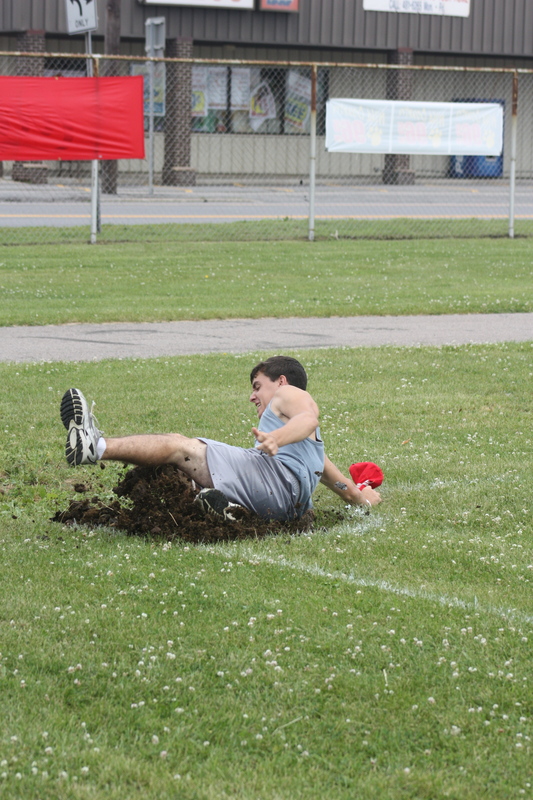 Both men and women showed what they had on tricked out lawnmower racing machines. These machines were loud and their noise was watch by the speed. While they don’t go as fast as the machines in NASCAR, it was clear that these drivers take their sport very seriously. From Malone, NY, we headed to the Saranac Lake Region of Upstate New York to spend the rest of our day and stay overnight. Some sites refer to Saranac Lake as the ‘…heart of the Adirondack Mountains…’ Judging from the scenery, its mountain vistas, countless lakes and rivers, its easy to see understand why one would fall in love with this picturesque area. I counted myself lucky that I was able to find an interesting place to rest our heads and recharge our souls. I managed to reserve a lean-to at Cochran’s Cabin. The site was a nice mix of primitive back-woods camping and such ‘luxurious amenities’ as a hot and cold shower. The site also included an oversize fire-pit – I actually had to step into the pit to light the fire. While we could not swim from our dock, we enjoyed an afternoon and late night swim a short walk from our site. After we had settled into camp life and enjoyed our afternoon swim, we were all hungry and decided to find some place to eat. Not wanting to settle for pizza or burgers, we decided to eat at the Tail of the Pup . 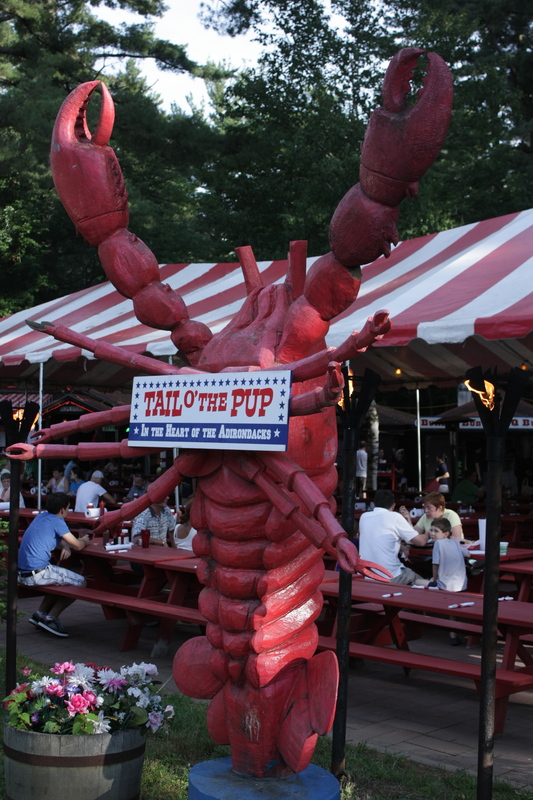 TOTP bills itself as Adirondacks only lobster-bbq family restaurant. With live music, a play area and the smell of BBQ, we were sold. We settled in for what turned out to be a wonderful dining experience. 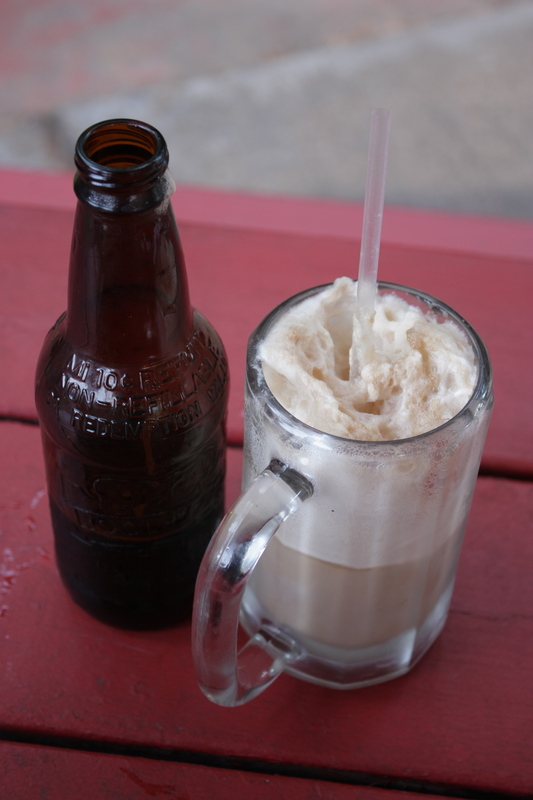 The music, the atmosphere and the root beer floats made the night. Simply – a wonderful day and superb evening. 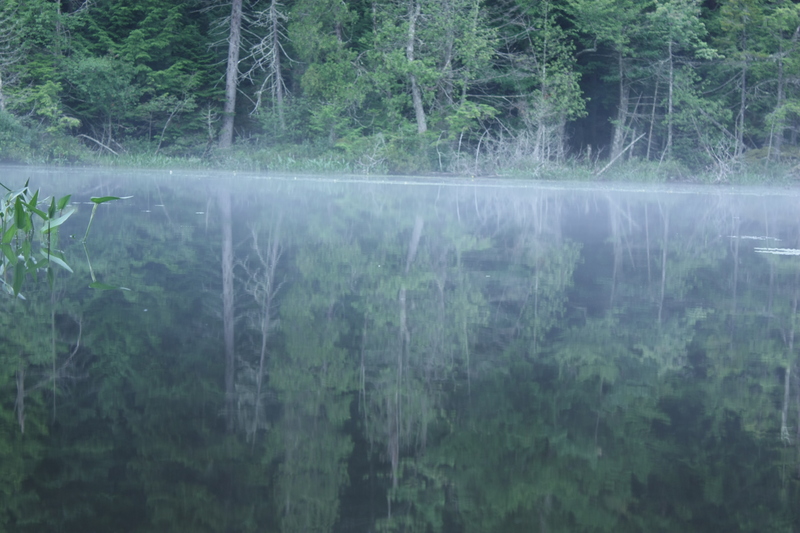 Morning broke and it started with a morning paddle where we watched a Heron find and eat its morning breakfast and paddled into a wonderful lake were we were silenced by the majestic mountain scenery. Truly – a wonderful morning. After another morning afternoon swim, we headed into Lake Placid for the morning. From there, we turned of the GPS and made our way (the long way) back home. Another stop at a local beach, where Jaxson and I canon-balled countless times, a huge lunch (we decided to take a pass on the Woodsmen Games in Tupper Lake) and we made our way back to ‘our home and native land’. Although it was a quick trip, it did provide all the essentials of a wonderful family vacation. There was great food, great swimming and amazing Smores. What else could one ask for in a vacation? This post has been overdue, but I find myself with time on my hand and thought I would put it to good use. In a Twitter conversation, I shared some thoughts on my experience at Canada’s newest waterpark – Calypso. To celebrate Father’s Day – my son and I, along with Grandma, went to the $45M water park, located in Limoges, Ontario, just a short drive east of Ottawa. Jaxson, my son, was looking forward to this day for a long time. Although the weather was mixed, there was both sun and rain, we arrived at the park eager to get in a good day of sliding. And sliding we did. Many times over. One thing I appreciated about the park is that they provide personal flotation devices (PFD) for all ages. The PFD allowed Jaxson, Grandma and I to go on many of the rides. While Jaxson is brave enough or fearless enough to try all of the runs, his stature, at this time, prohibits him from doing so. In retrospect, this is probably a good thing. 1. You are allowed to bring in a cooler (no glass/no alcohol). It makes it easier to eat healthier and will also be easier on the pocket book. 2. Having even numbers will make it easier to get the most out of the park, without having one person be the odd one out. 3. You have the option of using a locker. It does make it easier to store your towel and a change of clothes for the drive home. It will cost you $5, but I found it useful. 4. It’s a waterpark, with moving water so leave the watches, bracelets, etc in the car or at home. Grandma learnt the hard way. 5. The line-ups moved quickly. I recognize that this is entirely dependent on the weather and the number of sliders, but found that the staff kept the operation running smoothly. 6. It’s a waterpark and it is not immune to men and women from wearing, in my opinion, ‘inappropriate swimwear’. 7. The weather was mixed, but sunscreen is a must. 8. Although, I don’t find them entirely fashionable, watersocks are a great alternative to sandals. The pavement can get slippery and we witnessed more then a few young children slip and bump their heads. 9. It’s a waterpark. Have fun! 1. I don’t understand the need to pay $5 for parking, when I have to pay over $100 to get into the park. 3. There is no family pass option. This may need to change. Overall we had a great time at the park. Jaxson enjoyed himself and before we left the park, he asked when we would be going back. I told him soon, real soon.